The midterms will be much different, but Democrats need better candidates. The special election for the open congressional seat in Georgia was the most expensive in history, with an obscene $60 million in total spending. Jon Ossoff, the Democratic candidate, narrowly lost in the upscale, suburban sixth district, which is heavily Republican. The chattering classes will speculate endlessly on what this special election means for the 2018 midterms. The election was seen as a referendum on Trump. 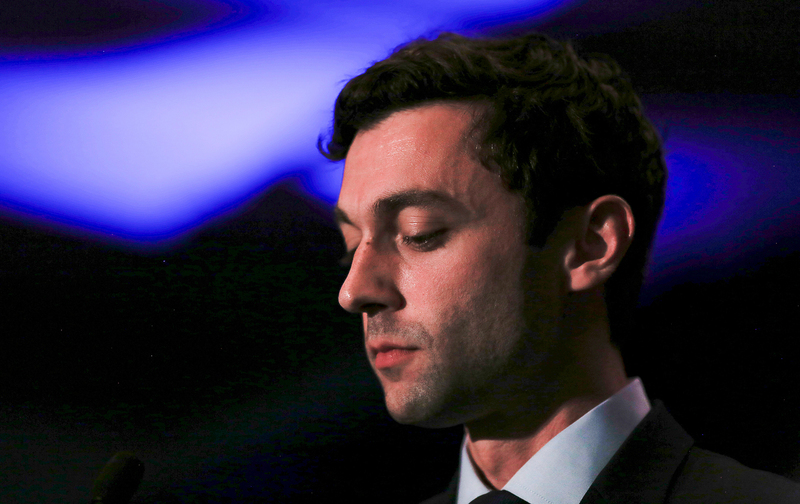 Ossoff lost by about 4 percent in a district that has gone Republican for decades. He outspent his Republican opponent, Karen Handel, yet he garnered a smaller share of the vote than Hillary Clinton received against Trump in 2016. For all the sound and fury, this signifies very little for 2018. For many voters, and surely for Trump’s supporters, the administration has just settled into office and still deserves a chance. Trump’s policies haven’t taken hold yet. Thus far he’s coasting on the Obama economy. Trump’s health-care, tax, and budget plans haven’t been passed. His stealth escalation across the Middle East hasn’t yet stumbled into open war. The 2018 elections, 17 months away, will take place in a very different atmosphere. Special elections get special attention. When $60 million floods a congressional district, it’s enough to rouse even the dead. The evident Democratic enthusiasm advantage got muted as even disengaged Republicans responded in the hothouse atmosphere. Incompetence and corruption are becoming the brand of the Trump White House. The outrage and mobilization of the activist base of the Democratic Party will continue to build. In Trump, Democrats have one of the greatest fund-raising and voter-mobilization engines ever. There are more than 70 Republican districts that vote more Democratic than Georgia’s sixth. Republicans may have dodged a bullet this time, but in 2018 they’ll likely be facing a fusillade. But Democrats will first need better candidates. For party pros, Jon Ossoff was close to an ideal candidate. Young, well educated, attractive, and articulate, the 30-year-old tailored his views to fit the suburban district. He presented himself as a centrist, speaking boldly against government waste and federal deficits, and talking, as his opponent put it, “like a Republican.” He championed civility and decried partisan division. He explicitly opposed Medicare for All and tax hikes on the rich. He wouldn’t even commit to voting for Nancy Pelosi as the leader of his party. He chose not to make the election a referendum on Trump. This likely foreshadows the Republican strategy in 2018: Nationalize the election and raise the specter of Pelosi taking the House or New York’s Chuck Schumer leading the Senate. Pelosi’s opponents in the Democratic party are using Republican attacks to question her leadership. But the answer isn’t to allow the right to define Democrats leaders—it is to force Republicans to defend or abandon Trump’s follies and to put forth a clear, bold alternative agenda for the country. In choosing to do neither of these, Ossoff allowed Republicans to set the terms of the debate. In the short term, Handel’s gave, in Frank Bruni’s words, “fresh hope for [Trump’s] stalled legislative agenda.” Defeat would have spread fears among Republicans worried about Trump’s mad-hatter antics, corruption, and incompetence. Instead, Republicans sought to use the victory to forge new unity around their substantive agenda: Trumpcare, tax cuts, deregulation, and budget cuts. But the GOP might quickly become the victim of its own success. Polls show voters hate a House health-are bill that even Donald Trump terms “mean,” and the Senate bill isn’t any better. Americans are more concerned that the rich and corporations don’t pay their fair share of taxes than they are excited about more top-end tax cuts. The deep cuts in Trump’s proposed budget—in education, Pell grants, home heating, and more—won’t gain popular approval. As David Frum argues, a defeat in Georgia might have sobered Republicans a bit. But, instead, they are likely to double down on defending Trump and pushing their agenda. For the activist base of the party—the Sanders-Warren wing that is on the march—the lessons of the special election are clear. The efforts to build an independent capacity to recruit, train, and support populist candidates up and down the ticket should be redoubled. The push to crystallize a bold agenda for change and debate it across the country is vital. Mobilization to resist Trump but also to challenge Democrats is needed. We know what the party pros will do. To take back the House, they want Democrats to focus on suburban districts, like the 23 Republican-held districts that Hillary Clinton carried, largely in the suburbs of Los Angeles, Philadelphia, and Washington. Rahm Emanuel and Bruce Reed wrote that these districts are “mainstream in tone and interest.” They want to recruit “credible candidates” that will “match their districts, not align with the party’s activist base.” As New Mexico Representative Ben Ray Lujan, chair of the Democratic Congressional Campaign Committee put it, “Let’s take the time to find people who fit their districts, have compelling stories, and work hard to earn support from voters.” They can count on Trump to rouse Democratic voters and money. All factions of the Democratic Party agree on the need for a clear economic agenda. But the pros, in the end, would rather bet on the empty-suit candidates than take a chance on populist tribunes who are demanding a mandate for fundamental change. “There are people who, as I often say, would rather have first class seats going down with the Titanic, rather than change the course of the ship,” said Bernie Sanders in an interview with David Sirota last week. If the popular movements of our time are to go from “resistance to power,” as Sanders told the People’s Summit, they will have to do so by building independent capacity while fighting to take over and transform the Democratic Party.